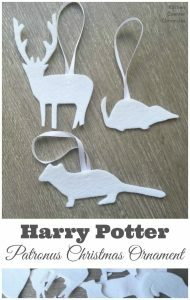 Oh how we love Harry Potter Crafts.. and oh how we love Christmas Crafts.. well it was only a matter of time before we brought the two together to bring you are great set of DIY Harry Potter Christmas Decorations. 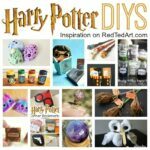 Trawling the internet, the majority of Harry Potter Christmas Decorations and Items tend to be “for purchase” on places like Etsy…. 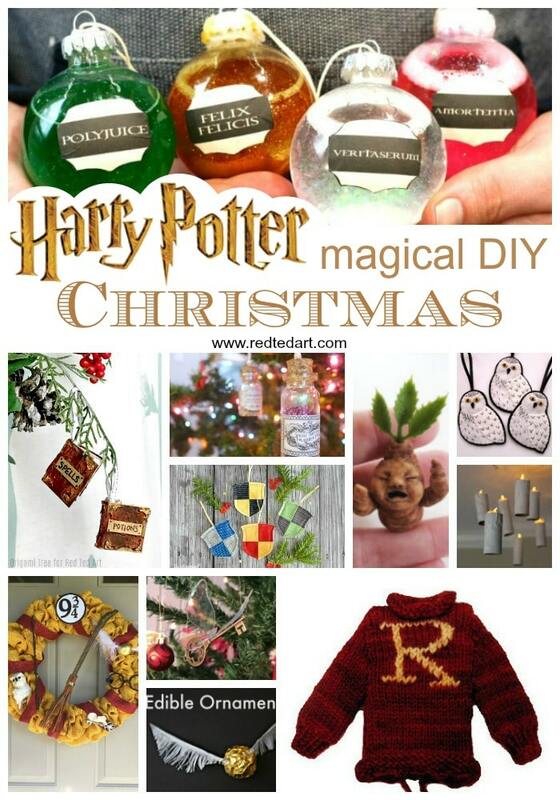 however, I have found a number of great Harry Potter DIY Christmas Ideas for you to make yourself. 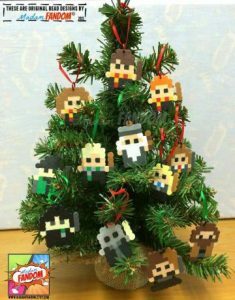 The majority of the Harry Potter Crafts are indeed ornaments – what better way to decorate for Christmas. 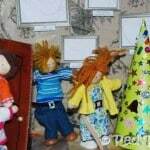 But there are some additinoal Christmas decorations and inspirations too. 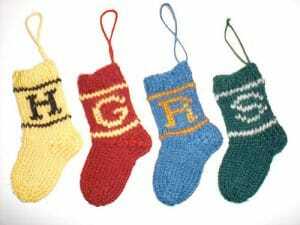 I do hope you are inspired to give it a go and make a truly magical Harry Potter Christmas!! 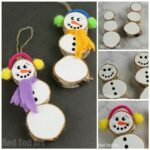 How we love Homemade Ornaments! 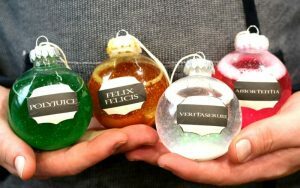 Adore these mini potions books that you can actually write in!!! 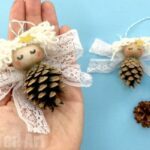 Get your craft supplies ready and get making! 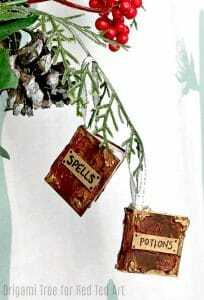 A simpler version of the potions books above are these “no glue” mini notebooks including printables. 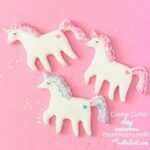 Make these, hang a ribbon and done! 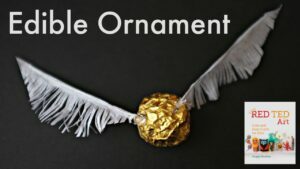 Or why not have fun with these festive edible snitch ornaments? 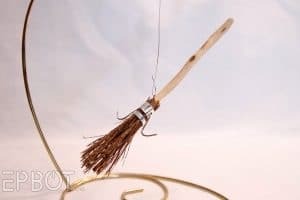 So cute and easy and of course so so soooo effective! 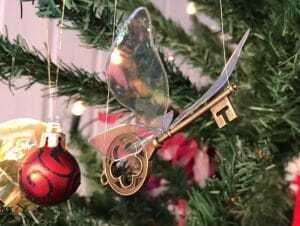 The Craft Maiden shows us how to make these great flying keys (including how to make your own wings!). Stock up on old keys here US/ UK (affiliate links). 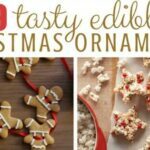 Originally by this etsy shop (affiliate link) – but take a look and maybe it will inspire you to make your own?! 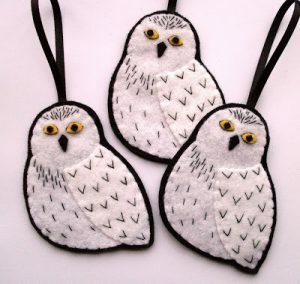 Learn how to sew your own Harry Potter House Ornaments by Hey Let’s Make Stuff! 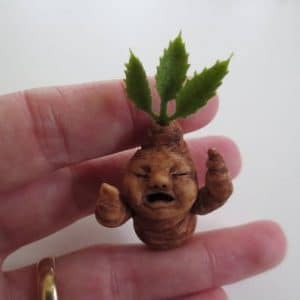 Oh my oh my oh my….. this DIY Mandrake Ornament on Craftster really is simply FABULOUS! 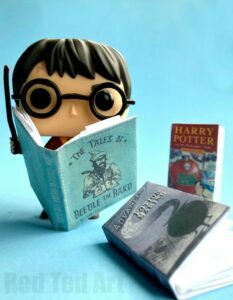 Must make. 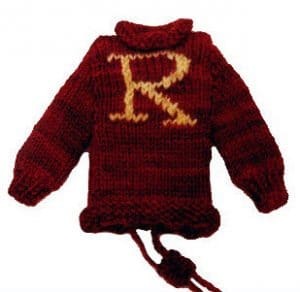 Harry Potter and Ron Christmas Jumper ornament by Ravelry (actually a Cell Cozy!! 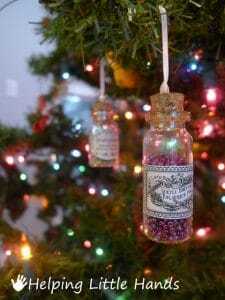 But I think it doubles up nicely as an ornament!). 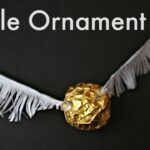 My son has already said we MUST MAKE these.. 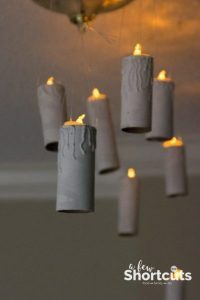 I think you can guess what these DIY Floating Candles are made from? And the best bit.. they are super easy. This particular set is by A Few Shortcuts! 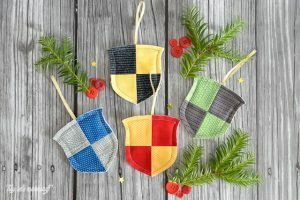 Finally.. once you have all your Harry Potter Christmas goodies made.. make use of these free Harry Potter Gift Box printables and “wrap them up” for giving. 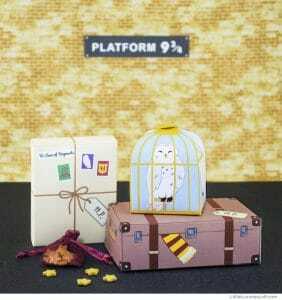 Hop over to Little Luxuries Loft for info! 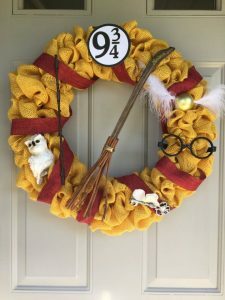 I leave you with this AMAZING image of a Harry Potter Wreath by this Etsy Seller. 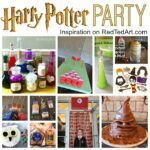 Unfortunately it is sold out, but I think it provides amazing inspiration.. and you may also enjoy browsing the rest of this Harry Potter Shop! 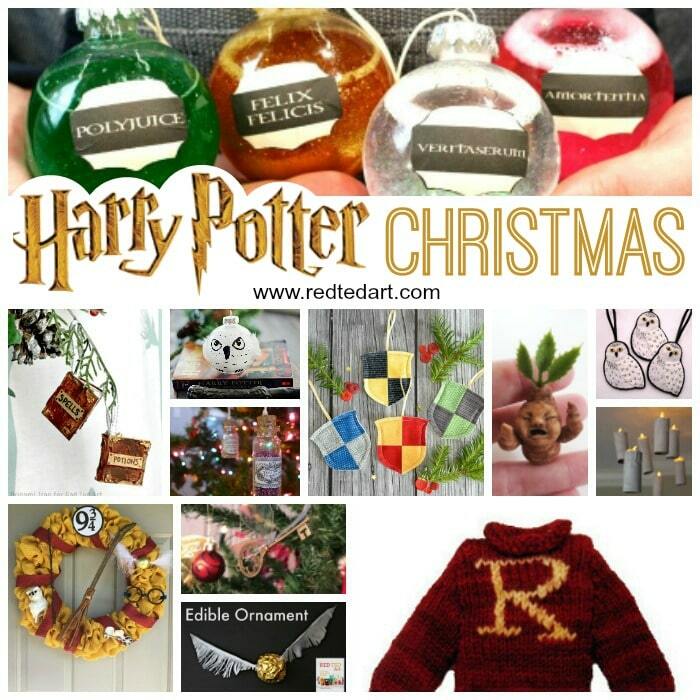 This is it for my DIY Harry Potter Christmas ideas!! 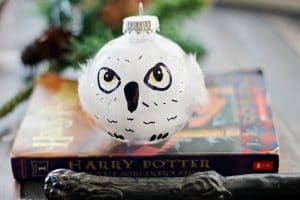 There are SO many Harry Potter Ornaments that you can purchase.. but I do hope that this collection of DIY ornaments inspires you to get making!! Enjoy.